1. Heat butter in a large pan over medium flame. 2. Add the onions and cook till very soft and lightly brown, around 25 to 35 minutes. 3. Add the thyme, bay leaf, garlic and cook for a minute. 5. Pour the stock and bring to a boil. 6. Reduce flame and simmer for 10 minutes. 7. Cover with a lid and simmer for 1 to 2 minutes. 8. Remove bay leaf and garlic. 10. Garnish with parsley and serve hot. Tip: Serve with garlic bread. 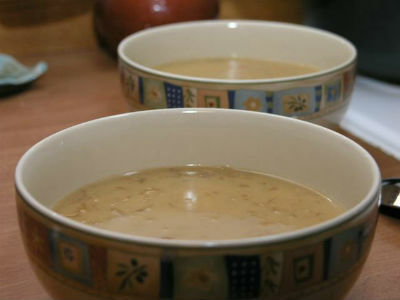 Feel free to comment or share your thoughts on this Onion Soup Recipe from Awesome Cuisine.